October 23, 2014, Rybinsk. - NPO Saturn (a company in United Engine Corporation of the Rostec State Corporation) celebrates 98 years since its founding. A company incorporated back in 1916 as the Russian Renault joint venture in Rybinsk until 1924 specialized in the automotive industry, and since then its history has always been closely tied with the development of Russian aviation. Today, having integrated the production sites and design bureaus of Rybinsk, Moscow, Lytkarino, Saint-Petersburg, Omsk and Perm, NPO Saturn is known for design and manufacturing of gas turbine engines for military and commercial application, cruise missiles, energy-generating and gas-pumping installations, Navy boats and commercial ships ensuring the end-to-end life cycle of its products from conceiving the design all the way to serial production and service support. The past 98 years embody a whole series of glorious events, names and achievements linked to the company. The first aviation engine delivered by the company was a license-produced BMW-6 engine whereby serial production was mastered in Rybinsk under the name M-17, which came as a true milestone in the history of the Russian aviation industry. With the onset of serial production of the domestically-produced M-17 engine, Russia no longer depended on the foreign manufacturers. Throughout its history, NPO Saturn has designed around 40 types of products having serially manufactured around 50 thousand aviation engines installed on fighters, bombers, transport aircraft and passenger liners. The names of the renowned designers such as Vladimir Klimov, Vladimir Dobrynin, Arkhip Lyulka, Pavel Solovev, Petr Kolesov went down in the history of NPO Saturn and equally in that of Russia. The NPO Saturn engines took to the sky and do so today the aircraft designed by the design bureaus of Polikarpov, Yakovlev, Tupolev, Lisunov, Ilyushin, Sukhoi, Mikoyan, Beriev, Myasischev and Antonov. In early 40’s, the Rybinsk manufacturer had increased engine delivery rate for combat aircraft and by the beginning of the Second world war delivered up to 45 engines on a daily basis! The German bombers would drop onto the company leaflets asking not to dismantle the production shops and promising not to bomb the plant, which at nighttime was already preparing to relocate its facilities beyond the Urals and in fall of 1941 was fully moved to Ufa. As early as in spring 1942, the production of aviation engines started its reconstruction in Rybinsk; a few months later repair operations were resumed shortly followed by serial production of the engines so needed by the country at war. The D-30KU/KP engine series delivered by NPO Saturn since 1971 for middle-range Tu-154M, long-range Il-62M and transport Il-76 aircraft emerged as a true bestseller of the Soviet/Russian aviation. To date, the overall time on wing for the D-30KU/KP has exceeded 60 million flight hours; over 8000 engines delivered; around 2000 engines are operated worldwide. At present NPO Saturn continues to increase delivery rate of its serial products of civil and military application accumulating a research-&-technology backlog of knowledge which will allow the company to stay competitive in the future. The company welcomed the new year 2014 by yet another milestone. NPO Saturn had successfully completed the design and development stage of a new, small-sized gas turbine engine. During the sitting of the extended State commission, the company was solemnly presented with a certificate of completion of the state-witnessed ground tests of the new prospective engine. In February the company’s assembly shop 80 shipped to Komsomolsk-upon-Amur the hundredth serial SaM146 engine destined to power the SSJ100 aircraft. In total, to date NPO Saturn has assembled and delivered over 140 serial engines. On March 6, 2014 NPO Saturn was granted an EASA certificate authorizing the company to perform MRO activities in relation to the SaM146 engine having thus become the first company nationwide holding a full portfolio of Russian and European certificates to serially manufacture, maintain and repair commercial aviation engines. At this moment NPO Saturn is given the key role in ensuring the creation of an import-substitution base for Russian marine gas turbine manufacturing to be able to supply the ships with Russian-made gas turbine power plants. In view of that, throughout the year the company was frequented by government delegations, representatives of the chief command of the Russian Navy, and the leadership of United Ship Corporation. Conjointly with INTER RAO IES and ROSNANO, NPO Saturn is working at the creation of the GTE-110M - an upgraded version of the GTE-110 gas turbine engine delivering 110 mW of power. Saturn happened to be the only company able to provide Russia with high-power gas turbines under the sanctions imposed by a number of countries. Innovative ideas in their practical application were demonstrated at the International technological forum “Innovations. Technologies. 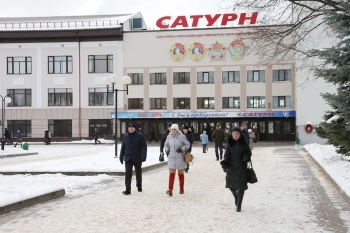 Manufacturing” taking place in Rybinsk in March 2014. That event had brought together the delegates from major high-tech corporations and the representatives of the small-to-medium business, as well as the higher learning institutions and the leading R&D organizations. One of the key events staged at NPO Saturn in October 2014 was the fifth innovative session of the Rostec State Corporation which was an acknowledgement of the high level of its innovative development in the frame of United Engine Corporation. The event participants - representatives of the companies in the corporation, the scientific circles, the development institutes, as well as the innovation and venture funds - were able to receive new knowledge, share their ideas and experience in the field of innovative activity and find new partners. This year NPO Saturn was recognized as the “Best industrial company” in the Yaroslavl Region. NPO Saturn maintains its status of a socially responsible company. Having joined the new federal housing program, Saturn started the implementation of a new housing project for the young and talented company employees whereby the construction of a new, multi-apartment building is starting in Rybinsk. The company is home to a team of bright and creative engineers not indifferent towards the future of the company and of Russian aviation as a whole. Traditionally, to celebrate the company’s birthday 102 engine manufacturers received the NPO Saturn achievement recognition certificates, 50 people were entered in the company’s Hall of Fame. The effort of 10 employees was recognized with a UEC honorary diploma, 10 people received the honorary diploma endorsed by the governor of the Yaroslavl Region; 20 employees were awarded the honorary diploma of the mayor of the city district of Rybinsk. The ministerial operations excellence insignia with the award of the “Honored engine manufacturer” title, the “Honored metallurgist”, the honorary diploma of the Russian Ministry of industry and trade and the appreciation of the Russian Ministry of industry and trade went to 27 company employees. The NPO Saturn Research and Production Association (OJSC) is an engine-building company specialized in the design and development, production and after-market support of gas turbine engines for military and civil aviation, naval ships and power-generating plants and gas-pumping units. The association is part of the All-Russian public organization The Union of Russian mechanical engineers whereby the regional branch is headed by I. N. Fedorov, NPO Saturn CEO. NPO Saturn is part of United Engine Corporation (OJSC) and acts as the leader of the Civil Engines Division, a business unit of UEC founded on 09.10.2012 as a result of integration of the following companies: NPO Saturn (OJSC), Aviadvigatel (OJSC), PMZ (OJSC), Metallist-PM (CJSC), Energetik-PM (OJSC), REMOS-PM (CJSC), Motoservis-PM (CJSC) and Zheleznodorozhnik-PM (CJSC). United Engine Corporation (OJSC) is a subsidiary of the OBORONPROM UIC (OJSC). The UEC structure integrates over 85% of Russia’s leading companies specialized in the design and development, serial production and after-market support of gas turbine machinery as well as the key enterprises - the industry’s integral players. One of UEC’s prioritized fields of activity is the implementation of comprehensive programs of development of the companies in the industry by introducing new technologies meeting the world-class standards. The OBORONPROM United Industrial Corporation (OJSC) is a multi-field machine-building group created in 2002. It is part of Rostec. The main fields of activity are helicopter building (the Russian Helicopters holding), engine building (the UEC holding) and other assets. The Rostekhnologii State Corporation (Rostec) is a Russian corporation established in 2007 in order to facilitate the development, manufacturing and export of high-technology industrial products of military and civil purposes. Today it comprises over 663 companies, which form 9 military-industrial and 5 civil industry holdings. Rostec’s subsidiaries are located in 60 regions of Russia and supply their products to over 70 countries worldwide. In 2013 revenues of the Corporation amounted to RUB 1.04 trillion, net profits were RUB 40 billion and total taxation exceeded RUB 138 billion.